The Port to Plains Heritage Trail focuses on the theme of transport. The trail covers the original routes from Lyttelton to Christchurch used by the early settlers and also covers several points of national interest in the history of transport. It is intended as a car trail. However at various points along the route there are walking tracks related to the theme or of more general interest. These are identified on the map and will be pointed out at appropriate points in the text. The separation of the city from its port with intervening high hills posed a problem for the new settlement. Originally Captain Thomas, the Canterbury Association's chief surveyor planned to have the port at Rapaki, with the city at the head of the harbour. 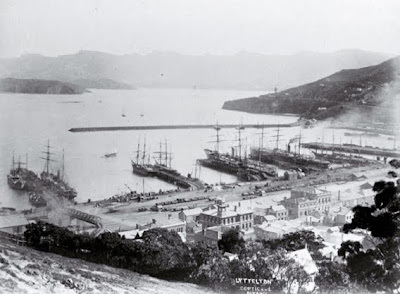 However, Rapaki was gazetted a Native Reserve, so the port was moved to Lyttelton. 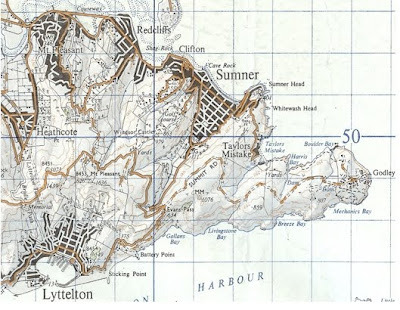 In the early years of the colony Lyttelton was the main commercial centre of the settlement. As the city grew the need to find a satisfactory solution to the difficulties of access grew more pressing. There were several proposals to develop a port on the Christchurch side of the hills. These included plans for a port at Sumner and plans for docks in the Estuary at Ferrymead along with an associated system of canals. From the early days of settlement the possibility of canals had attracted engineers and Linwood Canal Reserve was set aside in early plans (along the line of the present Linwood Ave) for a possible barge canal. In the end none of these proposals came to fruition, partly because of the natural limitations of the areas involved (the difficulties of the Sumner Bar and increasing problems of silting from the 1880s) but also because of changing transport technology. The obstacle posed by the Port Hills could not outweigh the advantages of a natural, sheltered, deepwater port, but the need to provide adequate access prompted some notable engineering feats and some firsts in our transport history. Begin at car park off Bridle Path Rd, next to Ferrymead House. After reading the memorial plaque drive up Ferrymead Terrace for a good overview of the site. Ferrymead Terrace was the original route of the Bridle Path. The lower road was constructed in 1852. 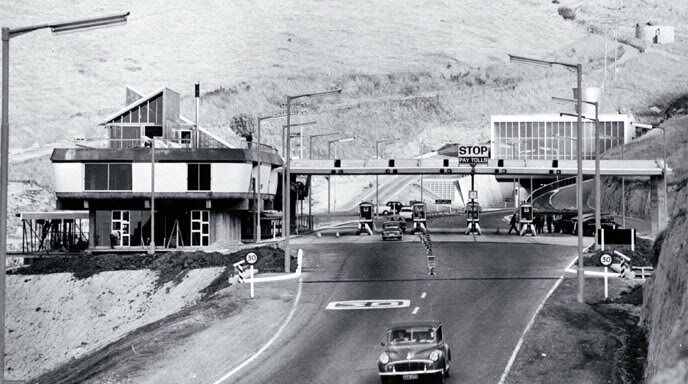 Before the rail tunnel diverted much traffic from Ferrymead to Heathcote, Ferrymead was a key transport hub for all forms of traffic between Lyttelton and the city as well as a natural crossing point for traffic proceeding to Sumner. The speed of modern travel and advances in bridge engineering make it easy to overlook its former importance but the clue to its past significance can still be detected from its name, which derives from its function as a ferry crossing point. A ferry service was established in 1850 and operated under a succession of ferrymen until displaced by a bridge in 1864. Although it was possible to cross the Heathcote further upstream, the ferry lay on the main route from Lyttelton to Christchurch. The original crossing point was under the present road bridge. In 1852 the site of the ferry was moved 400 yards upstream closer to Ferrymead House. The shingle which was laid down to give a firm footing is still visible at low tide. A cart service was available to transport passengers from the base of the Bridle Path to the ferry along the route of the modern Bridle Path Rd. From there the most direct route to the city was via Ferry Rd. In early 1851, one hundred labourers were employed to make Ferry Rd fit for traffic. Construction was completed before the end of the year. In 1852 Beresford's Royal Mail cart, the first public passenger vehicle in Christchurch, began carrying passengers between the town and the ferry, but at this early stage of settlement foot traffic still dominated. From 1861 a cart service began to run between Christchurch and Lyttelton via Sumner, providing an alternative to the service over the Bridle Path (established in 1857). By the end of the 60s there were several competing services on the Sumner route. 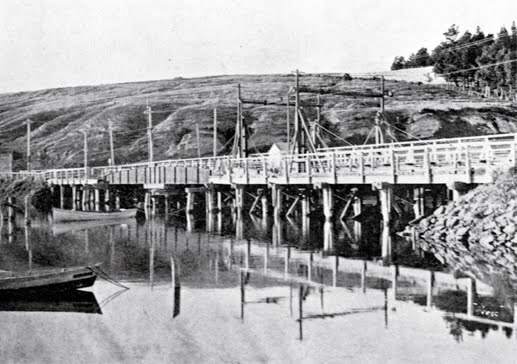 In 1862 the Provincial Council authorised construction of a bridge at Ferrymead, to be built in such a way as to allow navigation upstream. The bridge was designed as a wooden bridge in two parts connected by a wrought iron swing bridge manufactured in England by Robert Stephenson & Co. of Newcastle (a firm founded by the son of George Stephenson, builder of the pioneer steam locomotive "the Rocket"). The bridge was opened on 14 April 1864, replacing the ferry service. It operated as a toll bridge, despite public opposition (rates were half what had been charged for the ferry and there was no charge for pedestrians). In 1888 rails were laid on the bridge to allow steam trams to pass over but a stronger bridge was required when electric trams were introduced in 1907. In 1907 a new cantilever bridge was built 20 metres upstream from the swing bridge. Although designed to be opened to allow river traffic through, it was never opened after the initial opening ceremony as it wouldn't close properly. This bridge was replaced by the present road bridge in 1965, which is sited in the same position as the first bridge. An electric tram crosses the cantilever bridge over the Heathcote River on the road to Sumner, Christchurch. The first bridge and the jetty used by Colleen are visible behind it. Photo courtesy of Canterbury Public Library. In November 1881 the Canterbury Tramway Company began work on a tram line down Ferry Road. This reached the Swing Bridge in 1882 and remained the end of the line until 1888 when it was extended to Sumner. After the advent of the trams there was a decline in the importance of horse drawn traffic. Prior to completion of the Lyttelton - Summer Road, river transport was vital for removal of heavier goods from the port to the town. Lighter goods were generally carted by packhorses over the Bridle Path but anything unsuitable for packhorse would be transhipped through the estuary either up the Avon to the Bricks near Barbadoes St or up the Heathcote. Ferrymead soon developed as a major off-loading point for goods which could then be moved via Ferry Road, and later the railway, to the town. Although there were wharves further up the Heathcote as far as Christchurch Quay in Woolston, travel further upstream was slow and was only suited to smaller vessels. There were a number of private wharves in the vicinity of Ferrymead but in December 1863 the Railway Wharf was opened on the south bank of the river directly in front of Ferrymead House. The remains are still clearly visible there. The Railway Wharf was built in advance of the railway to allow off-loading of the rolling stock for the railway. Once the railway was operating it was used to load rail freight between Christchurch and Ferrymead. River traffic continued to be important until the opening of the Lyttelton rail tunnel, thereafter it declined dramatically. Between 1850 and 1867 when the rail tunnel opened, over 240 vessels of varying size worked the river trade on the Heathcote. 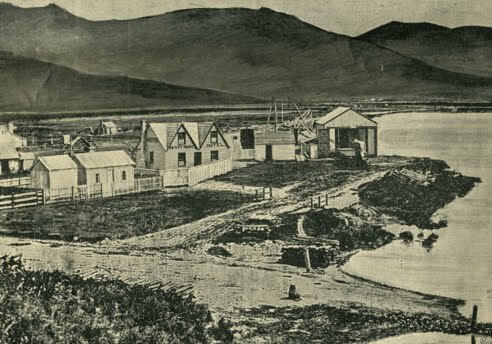 The area near the Heathcote Bridge at the foot of Mount Pleasant, Christchurch [ca, 1900] Part of the old wharf at which coastal ships used to berth is still visible in the background. Photo courtesy of Canterbury Public Library. On the north side of the river, adjacent to the bridge on the estuary side, there was formerly a Harbour Board Jetty from which the Canterbury Tram Company's paddle steamer "Colleen" departed for Sumner. This was a short-lived venture, lasting only from November 1883 to February 1884. "Colleen", which proved unsatisfactory because it tended to get stuck on silted up bends of the channel, was replaced in March 1884 by "Diamond". This service lasted until November 1888, when the tramway to Sumner opened. 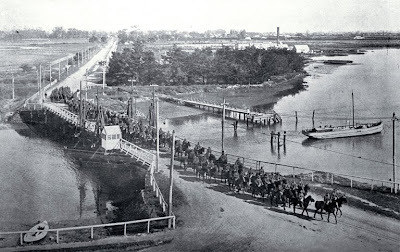 Members of the B Squadron of the Canterbury Mounted Regiment on their way to Lyttelton. The Colleen wharf is clearly visible [23 Sept. 1914] Photo courtesy of Canterbury Public Library. 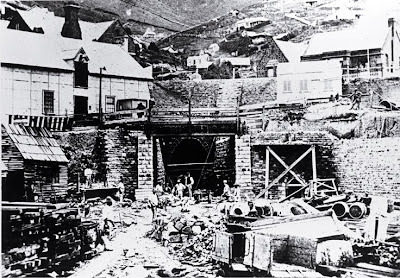 In 1859 the Provincial Engineer, Edward Dobson, suggested a temporary spur line between Ferrymead and Christchurch, while the rail tunnel to Lyttelton was under construction. The idea was taken up by William Moorhouse, Canterbury Province's second Superintendent. He pushed the ambitious scheme through in 1860 in order to solve the problem of efficient transport between the port and the plains, despite J.E. FitzGerald's disapproval of the idea. (FitzGerald started The Press to fight the scheme). On 6 May 1863 the first steam locomotive, "Pilgrim" was landed (unassembled) at the Railway Wharf and on 1 December 1863 the line was formally opened. It was the first steam passenger railway to operate in New Zealand. When the line closed in 1877 as a consequence of the opening of the rail tunnel, it once again made rail history, having the distinction of being the first line to close. The line may have been both short and short-lived, but it was an important milestone. It demonstrated the determination, progressivism, and vision shown by a small community which would soon lead to other significant rail developments, including the tunnel and the West Coast line, developments which would contribute greatly to the economic prosperity of Canterbury. The rail embankment is still clearly visible and is now used by the Canterbury Railway Society for its railway at Ferrymead Heritage Park. 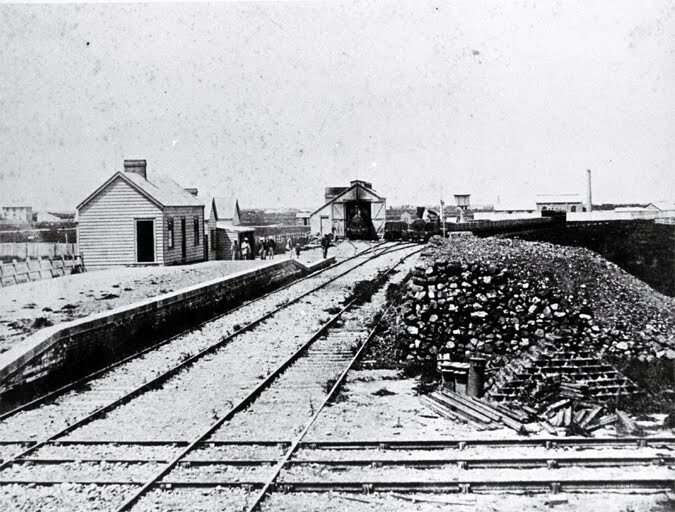 The first Christchurch railway station on the broad-gauge line that ran to Ferrymead: trains are no. 1 (Pilgrim) & no. 2 locomotives. [ca. 1864] Photo courtesy of Canterbury Public Library. This house, the oldest surviving building in Ferrymead, was erected by James Townsend, who arrived in 1851 and took over the ferry rights from Hughes. The house, which Townsend named Greenlands, was a "pre-built" one he brought with him from Tasmania. He later sold the house which was then run as a hotel under the name of the Ferrymead Hotel, until the closure of the Ferrymead line. On the opposite side of the river, on the site of the high-rise apartment block, stood the Heathcote Arms Hotel, also known as the Halfway House in its early years. This was originally owned by Thomas Hughes, the ferryman. A daily dray service operated between the Hotel and the Royal Hotel in Christchurch, conveying passengers and goods. Once the tram reached Ferrymead, passengers for Sumner alighted here to connect with the steamer service or to cross the swing bridge and connect with the coach service. Turn right into Main Road and note the Cob cottage almost immediately to the left. This was built around 1862 by Captain Penfold, Captain of the schooner "Excelsior" which traded between New Zealand and Australia until it was wrecked on the Sumner Bar in 1862. Penfold then worked on the construction of the Ferrymead Railway, building the cottage at weekends from sod cut from the river bank and material salvaged from the "Excelsior". The cottage has been largely reconstructed (with cob rather than sod). Continue along Main Road towards the causeway and stop just beyond the first culvert. You are now parked on the site of the tram line. Part of the tram bridge is still visible at the culvert. When the Sumner tramway line opened on 1 November 1888, the tramline followed the line of the shore alongside the original Sumner to Ferrymead road. In 1903 the Tramway Board, which intended to update the Sumner line with new electric trams, applied to build an embankment across the estuary, a distance of one mile, thus by-passing the slow, wandering stretch around the Bay. However, because it was only a single line trams still had to wait if another tram was on the causeway. The causeway was constructed with rock from a quarry located on the east side of the bay. Modern houses now occupy the site but evidence of a quarry is still visible. Work was completed in 1907 and the new electric tram service to Sumner commenced operation on the 29th of April that year. During the depression, the causeway was widened to accommodate motor traffic. Stone for the causeway was hauled by the Kitson No 7 Steam Engine, which is now one of the attractions of Ferrymead Heritage Park. On the sixth of December 1952, the Sumner tramline closed, replaced by a diesel bus service. Mt Pleasant: Major Alfred Hornbrook, of Mt Pleasant Estate, took it upon himself to signal the approach of ships to port from the summit of Mt Pleasant. The value of this role was recognised by a public subscription in 1853 to raise the necessary funds to supply him with a telescope, a flagstaff and flags. 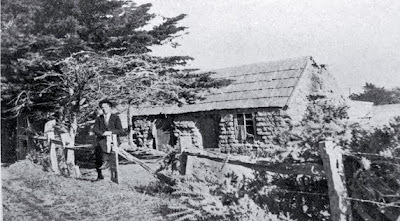 This system operated until 1868, when a lookout was established on Adderley Head. Major Hornbrook arrived in Canterbury from Wellington in 1849 and in December of that year, in anticipation of the arrival of the first four ships, established the Mitre Hotel beside the start to the Bridle Path to provide food, drink and accommodation for the settlers This was probably the first hotel and commercial enterprise in Canterbury. 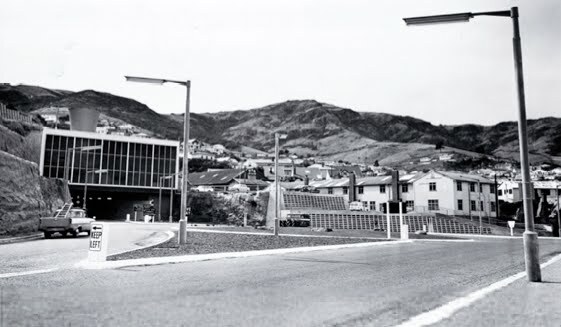 Part of a track used by the Major to travel between Lyttelton and his home (near the junction of Mt Pleasant Rd and the Summit Rd) still exists as the Major Hornbrook Track. As you drive off the causeway you will pass through The Cutting. The Cutting: Prior to 1855 when the road was cut through the headland leaving the isolated rock that exists today, the road skirted the base of the headland before proceeding over sand hills and tidal flats. The realignment shortened the route but in the early years it was a dangerous section of the road, a rise in elevation combined with a bend proving difficult for coaches. The advent of trams in 1888 forced improvement in the road. Over the years successive efforts at levelling and widening the road to meet changing traffic demands have made it difficult for the modern traveller to imagine that early travellers could ever have viewed this portion of the road with trepidation. Stop at Redcliffs Park to view Moa Bone Cave then proceed to Barnett Park to view Moncks Cave at the base of Cave Terrace. There is a walkway to further caves in the hills above the Park. Moa Bone Cave Te Ana o Hineraki well known for the discovery of moa bones there by Sir Julius von Haast, first director of the Canterbury Museum, when he undertook the first serious excavation of the cave in 1872. But this cave and Moncks Cave at the base of Moncks Spur bear witness to the earliest history of transportation in the area. The Moa Cave contained what is believed to have been the remains of a canoe shelter as well as sandals whilst the artefacts discovered in Moncks Cave included a kauri steering paddle, a totara bailer, an outrigger float, and a toy canoe and paddle, which serve to remind us that for many centuries canoe and foot were the only means of transport in the country. In the early years of European settlement, Moa Bone Cave served as shelter for road workers, while Moncks Cave, which had been shut off by a landslide, was discovered by road workers clearing rubble from the base of Moncks Spur in 1889. Continue into Moncks Bay. Immediately as you enter the bay note the attractive stone tram shelter on the left hand side of the road which now serves as a bus shelter. You can park at the far end of the bay. From here you can see back to the Yacht Club. Christchurch Yacht Club is located on the site of Moncks jetty, a private jetty built by Mr J. S. Monck some time after taking up residence in the Bay in 1869. This was the first jetty in the area, used to bring in goods and ship out produce from the farm at a time when coastal shipping was still the main means of transport. Later the steamboat "Colleen" called at the jetty when required and when the sailing club was founded in 1891 it served as the club jetty. Monck was a keen sailor and the first Commodore of the club. Another jetty, Burns Jetty, was located approximately midway along the cliff face at the estuary mouth end of the bay. Proceed around the bend and park at the car park on the left to view site of the original bar, the present bar, the site of the second causeway, Cave Rock and Clifton Heights. 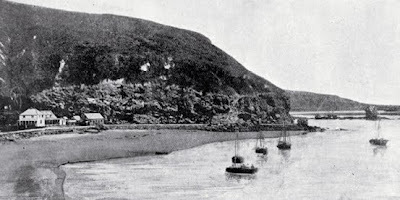 The original Sumner Bar extended across Clifton Bay almost to Cave Rock (Tuawera); the entrance to the tortuous channel, which could only be negotiated at high tide, was close to the rocks. At times vessels might be delayed for up to six weeks until conditions were safe enough to attempt crossing the sand bar, but this did not prevent loss of ships and cargo. Between 1851 and 1886 there were at least 34 wrecks on the Bar not counting the vessels which only lost cargo. On the 22nd of June 1860 three vessels were lost in one day, but it was not until the 1st of September 1864 that the Provincial Council set aside money for the provision of tide signals on Cave Rock. These were first used on the 12th of September. William Henry Turner was appointed Pilot for the Sumner Bar on the 3rd of October 1864 and money was also granted to erect a beacon on the rocks. Stakes marked the channels in the estuary and at a later date a tripod was placed at the confluence of the channels in the estuary to assist navigation. Despite the difficulties of the Bar, the route was in constant use in the 1850s and 60s as the only practical way of bringing heavy goods from the Port to Christchurch. A series of storms in the 1930s moved the outlet to its present position by Shag Rock (Rapanui). 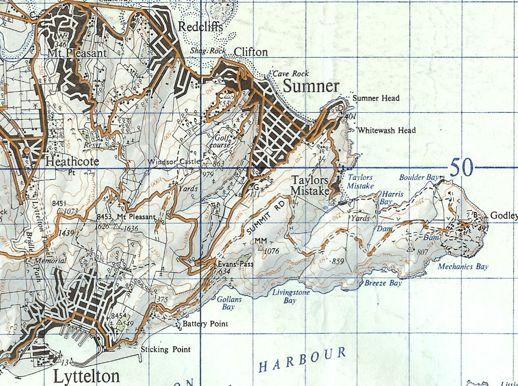 Clifton Heights: The original Sumner Road ran under the cliffs. Part of the road is still visible opposite the car park. When the tram was introduced it ran next to the road. Following a major rock fall in 1914, the Tramway Board decided to construct a causeway to avoid the delays and danger caused by rock falls. This opened in 1916. The present road follows the line of the tram causeway. 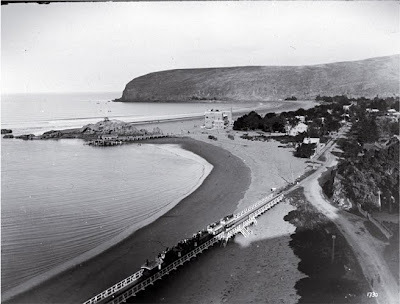 After the causeway, the tram crossed what was then the sandy beach of Clifton Bay by means of a trestle bridge. Walk around the corner to the Surf Club car park, [which is built over the top of the trestle bridge site], for a better view of cave rock and Clifton. Clifton Bay: Before the position of the Bar changed Clifton Bay provided harbourage for vessels. The Canterbury Association built a store here in 1849, for holding goods in transit to Christchurch. For a short while, George Day and his family, Sumner's first permanent residents, lived here until their own home was built. 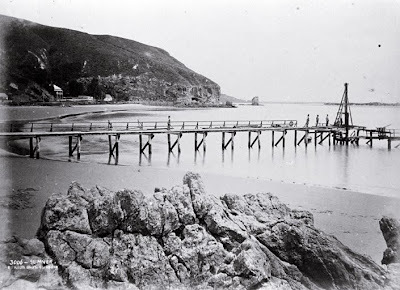 The Day family emigrated from Kent in 1841 and settled at Day's Bay, Wellington. After an earthquake in 1848 they sailed to Canterbury. George Day was the first to transport goods and passengers from the First Four Ships and was responsible for shipping totara logs from the Pigeon Bay for the piles of the first wharf in Lyttelton. For a time he also worked as overseer on construction of the Sumner Road. His son Joseph became the Sumner Signalman in 1867 and a little later took over as the Sumner Pilot, a position he held for 45 years. He was responsible for many rescues on the bar and the Sumner Lifeboat Brigade (forerunner of the Lifeboat Institution) was formed under his leadership in 1898. A memorial to Joseph Day on Cave Rock is sited on the outer wall of what used to be the Lifeboat Control Tower. (Built 1898) The Pilot boat was kept in Cave Rock until 1903 when a boatshed was added to the eastern side of the jetty. Clifton Hill: Sir Joseph Kinsey, who ran a Lyttelton Shipping Agency, owned one of the first houses on the hill; he hosted members of Captain R. F. Scott's Antarctic expedition there in 1910 and contributed to the organisation of the venture. Captain Scott and his wife took their last walk together on Sumner Beach. From 1902 Samuel Hurst Seagar's Clifton Spur Garden suburb (behind the present Surf Club) was developed with Arts and Crafts bungalows accessed by tracks: the unfenced gardens merge. The advent of the trams encouraged development. Sumner Pier: The old Sumner Pier, built by the Lyttelton Harbour Board in 1883, was located on the west side of Cave Rock. It was to here that the paddle steamer, "Colleen", brought passengers from Heathcote. In the 1920s the motor launch, "Tuariki", ran a service to New Brighton. Sumner was so named by Captain Thomas in 1849, in honour of J. B. Sumner, the Archbishop of Canterbury, Canterbury being a Church of England settlement. 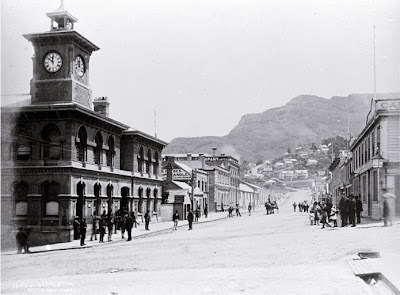 The township was expected to develop quicklybut the delay in finishing the Evans Pass Road and the 1860 plans for the Lyttelton rail tunnel slowed its development. It gradually grew to be a popular weekend and holiday resort, especially after extension of the tramline to Sumner in 1888. Marine Hotel: Provincial Engineer Edward Dobson built a sod cottage on this site in 1851. He designed the Evans Pass Road, oversaw construction of the Lyttelton railway and rail tunnel, the Arthur's Pass Road (named for his son) and much more, before resigning in 1868 because of problems with the harbour works at Lyttelton. Morten's hotel was established on the site in 1869 and was a staging post for passengers from Lyttelton. The Marine Service Station was originally a livery stable. 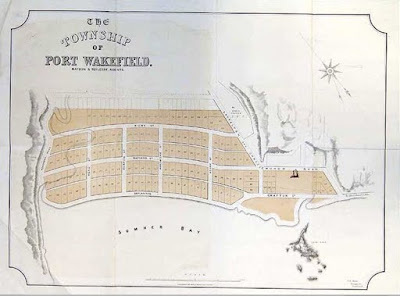 Wakefield Avenue: Felix Wakefield, E. G. Wakefield's youngest brother, who advocated the triangulation surveying method for use in the Canterbury Association settlements, was the first owner of Rural Section No 2 -half of Sumner. 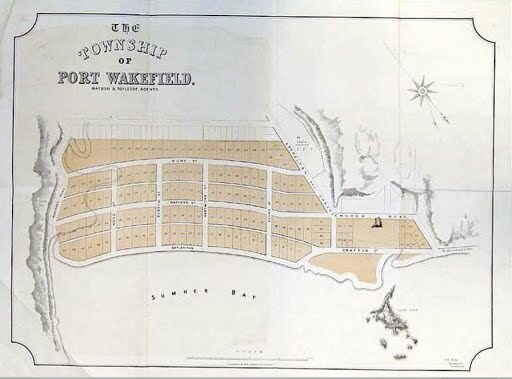 He had an ambitious scheme to develop his land as "Port Wakefield". A port in Sumner would never have been viable from an engineering point of view, but the advent of the railway finally put paid to any plans for such a development. Continue up Wakefield Ave towards Lyttelton. Stop just after Paisley St where you will see the entrance to the Captain Thomas Walkway sign-posted to the right. You may take the walkway, returning via the road to make a round trip. This was the original line of the Evans Pass Road which was partly formed in 1849-50 under the supervision of Captain Thomas. However, when completion of the road was finally undertaken in 1857, Dobson chose the present route on the south side of the valley. Continue up the hill to the Evans Pass car park, overlooking Lyttelton Harbour. Observe the line of the Captain Thomas Walkway on the northern side of the Valley as you drive up. Just before the car park, the road crosses the intersection of the Summit Road and the extension of it to Godley Head. The First Road: The Evans Pass route was pointed out by Lieutenant Evans of the survey ship "Acheron". A route with a steady 1 in 20 gradient was surveyed by Captain Thomas, who hired 150 labourers from Wellington to build it. When John Robert Godley, the Canterbury Association's chief agent arrived in 1850, he halted all Thomas's works owing to shortage of funds and the road remained incomplete. It was J. E. FitzGerald, first Superintendent of Canterbury Province, and an opponent of the railway plan, who pushed for completion of the road in 1857 along a revised route chosen by Dobson. A tramway to Gollans Bay and a tunnel through the summit were mooted but neither eventuated. Instead a nearly level road was continued from the point where it had stopped to as far as Gollans Bay. By abandoning Thomas's steady gradient, Dobson's route avoided troublesome rocks which had proved difficult and expensive to deal with and had contributed to the shortage of funds for completing the road. However, as a consequence of this diversion, beyond Gollans Bay the road was forced to rise precipitously by a steep zigzag to Evans Pass. FitzGerald was first to drive over the road in his famous tandem dogcart with six-foot wheels, known as the "Circulating Medium". 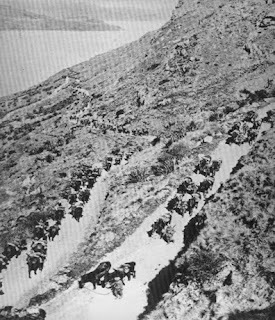 A procession from Lyttelton met the cavalcade at the summit, where Fitzgerald's three passengers, Charles Bowen, Richard Packer and John Marshman (who had made his will the day before), alighted to help control the cart's descent of the zigzag by means of ropes, aided by a large crowd. Cobb & Co and Bruce and Coe soon ran a daily coach service to Christchurch. Passengers were obliged to get out and walk the steep parts and accidents were frequent. The route was not available for heavy goods which had to go via sea or railway. In 1900, Cantabrians were still lamenting the lack of a convenient road between the port and the plains, and the exorbitant charges the Railways Department could demand for freight. The zigzag was finally bypassed in 1916, being realigned to the original bench marks of Thomas's "trotting gradient" road. The 1857 road to Gollans Bay is now used for access to Lyttelton Port Company's Quarry. The notorious zigzag was quarried away in the 1960s. Gollans Bay: Gollans Bay, below the Pass on the harbour side, was used as a camping site by the road gangs. Cargoes of livestock from Australia were usually discharged at Gollans Bay in the 1850s and 60s. For many years the area was used as the Lyttelton Dump, and in the 1960s for quarrying to form Cashin Quay. Godley Head: A lighthouse to guide ships into Lyttelton Harbour was first approved in 1849 but it was not until 1865 that a lighthouse was actually completed. It stood on the site of the existing Godley Battery and was visible for 29 nautical miles. There was also a fog signal. The lighthouse was re-sited 30m down the cliff to make way for Godley Battery, begun in 1939. The light was automated in 1976. The Summit Road: The Summit Road resulted from the vision and dedication of Harry Ell, MP for Christchurch and early conservationist. He foresaw that the hills with their views and characteristic indigenous vegetation provided a recreational haven and fought to protect this asset for the benefit of future generations with a series of reserves linked by a road with rest houses at intervals along the route. Work began on the Summit Rd in November 1908. Progress speeded up in the 1930s when he was able to make use of hundreds of relief workers, whose wages were paid by the Unemployment Board. Continue down Sumner Road to the car park at Sticking Point. This is the place where work on Captain Thomas' road to Sumner was halted for seven years because of lack of funds to cut the hard rock. It provided early settlers with a pleasant short promenade. The road and much-repaired red stone walls alongside were built by the Hard Labour Gang of the Lyttelton Gaol, using stone from the Sumner Road Quarry (situated a little further down the road on the right). Originally a series of large carved stone heads were placed at intervals along the wall. The container terminal which can be seen below the Point is Cashin Quay, named after J. B. Cashin, the engineer who oversaw the project for the Harbour Board. 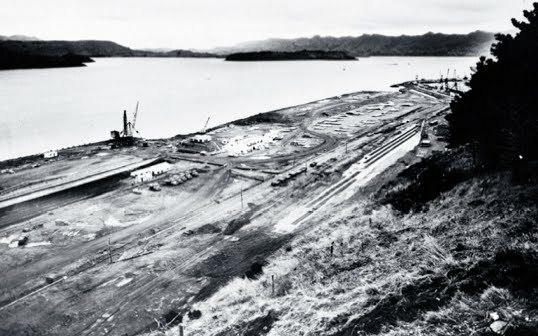 Construction began in 1958, in response to a need for increased berthage and bulk handling facilities. The first section opened in 1964 although the Quay was not adapted for container use until the 1970s in response to the growth in this method of cargo handling. A new container crane was in place by June 1977, in time for the arrival of the first container ship to visit Lyttelton. This Gothic style building was designed by Thomas Cane in 1876, one of the Canterbury Province's final projects. It was built mainly by prison labour using local stone. The New Zealand Historic Places trust owns the building which is open to the public. The zinc ball on the tower was raised to the top of the mast shortly before one o'clock and a Morse signal would release it to drop at one o'clock GMT. Ships chronometers were then adjusted to ensure correct navigation. The signal mask in front of the building would relay flag signals from a similar mast at the station at Adderley Head to indicate which vessels were entering port. The rock was first placed in the 1930s to the south-west of the present site, in commemoration of the Association settlers of 1850-1851who came ashore near this spot. The jetty which Captain Thomas built at the end of Oxford St has long been buried under the reclamation of the 1860's, carried out to accommodate the railway traffic. In 1990, the rock was re-sited close to the beginning of the 1849 Canterbury Association Jetty. The drain at the end of the stone gutter shows the position of the original shoreline. In the early 1850's the most valuable land of the Canterbury settlement was on the north side of Norwich Quay, close to the point of communication with the rest of the world. Hotels, warehouses, banks, shipping agents, merchants, barbers, dining rooms, and newspaper offices, all of timber construction, lined the street. All this was swept away by a huge fire in 1870, to be replaced with the brick and concrete buildings of today. On the south side (known as the Beach) the Canterbury Association Store adjoined the jetty, on the site now occupied by the 1875/6 Post Office and Government buildings. The Telegraph Office (with a 1920s brick front) is the building where the first telegraph in New Zealand was transmitted in 1862. This allowed the arrival of new ships in port to be notified in Christchurch without need for a Constable to ride over the Bridle Path. Forbes Store is the only pre-1870 commercial building to survive in Lyttelton. Other buildings along the Quay were demolished in the 1970s because of a road widening plan that was later shelved. Forbes Store was built when lighters could load and unload directly from the back of the building. Until more wharves were built, only the smaller vessels could berth at the jetty. Others had to anchor in the harbour and were dependent on lighters for unloading. Lighters continued in use until adequate cranes were provided. Two steam hoists were erected in 1867 as well as a hand-operated 5 ton crane. The first steam crane came into use in 1873 but this did not fully displace lighters. Electric cranes came into use in 1921. At the east end of the Quay is the Lyttelton Museum (the 1911 building was originally the George V Seafarers Institute) which houses a collection of colonial, maritime, and Antarctic memorabilia. Opposite is the railway signal box (re-sited from the Moorhouse railway tunnel portal in 1992 ) and the 1880 Lyttelton Harbour Board offices, designed by Frederick Strouts. Continue along Norwich Quay and park just before the intersection with Dublin St. Cross the road to Sutton Reserve to view the harbour and the road tunnel. Agitation for a harbourmaster and safe moorings started in June 1851 when the settlers had their first experience of a southerly buster. Several vessels were damaged and Sydney trader J. T. Peacock's vessel 'Torrington' was a total loss. By the end of 1851, Captain Parsons was appointed as the first harbourmaster. In 1857, the first jetty was lengthened and Peacock, who had settled in Lyttelton, built another wharf at the west end of the beach. From 1860, flat land for railway was a priority and reclamation proceeded eastward at a slow pace as the depth of the mud on the harbour bed presented problems. A short wharf was built near the original railway station at the bottom of Dublin St. In 1862 an English Harbour Commission was asked to decide the best plan for the inner harbour. They recommended building two long moles and the work was begun by the Hard Labour Gang from the Gaol. Gladstone Pier on the eastern breakwater opened in 1874 and contractors completed the moles in 1876, just before the end of the Provincial Government period. The Lyttelton Harbour Board 1877 continued with the original plan, with the addition of the Dry or Graving Dock to the west (completed in February 1882 and officially opened in January 1883). The layout of the inner harbour, with its six finger wharves, is essentially the same as it has been since the 1880s. 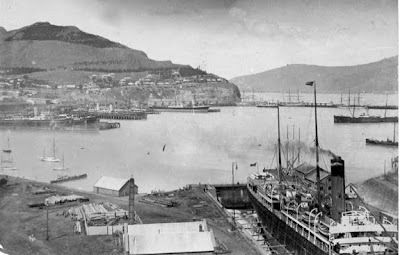 Lyttelton Harbour (ca, 1890) with the graving dock in the foreground. The tank farm and tanker wharf was built in 1927, reflecting the growth in internal combustion engines as a means of transport and the development of the bulk tanker to meet the growing demand for oil. In the mid 1960s the road tunnel and Cashin Quay were built and the inter-island ferries were adapted to roll-on roll-off. To make vehicle access easier, an overbridge was built at the bottom of Oxford St and the old footbridge over the railway line was demolished. The inter-island ferry service (which had begun in 1895) ceased in 1976, at the same time bringing to an end the last passenger train service to serve Lyttelton, the "boat train". Regular passenger services had come to an end in 1972. 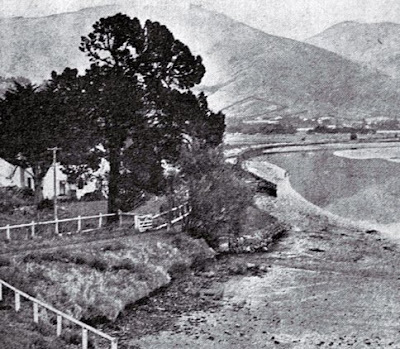 In 1922 a Port and City League was formed to promote a road tunnel to Lyttelton but the plan was opposed by supporters of a Port Christchurch in the estuary. It was not until August 1960 that plans for a tunnel were approved, when an empowering Bill was passed. Tenders were let in June 1961 and by 15 June 1962 the two sides of the tunnel met. The tunnel was opened on 27th of February 1964. Now road vehicles could get to the port quickly and easily and the long stranglehold of the railways on Lyttelton trade was challenged. The entrance to the 1867 Rail Tunnel is visible below the level of the road tunnel. For a better view follow the path down to the road below the park. Also observe the historic stone wall. A short detour to the right up Dublin St will take you to the start of the Bridle Path. Proceed through the Road Tunnel. Note the former Tunnel Authority Building designed by Peter Bevan. The building, which symbolises a moored ship, won an Institute of Architects Award when it was built and was awarded a 25 year gold award by the Institute in 2000. Take the exit to the left into Bridle Path Road and then the first right into the Bridle Path car park to view the Bridle Path. The Bridle Path was cut by Captain Thomas in 1850 prior to the arrival of the first four ships in December 1850, when it became apparent that the Sumner Road would not be completed in time. Initially the track could scarcely be described as a bridle path, but by early 1851 it had been made passable for horses along its whole length. Late in 1851 the track was further developed to cope with the increasing volume of traffic using it. On 17 March 1857, the first vehicle passed over the track, a luggage-laden spring cart pulled by bullocks. From September 1857 a daily cart and packhorse service operated for those who could afford it. 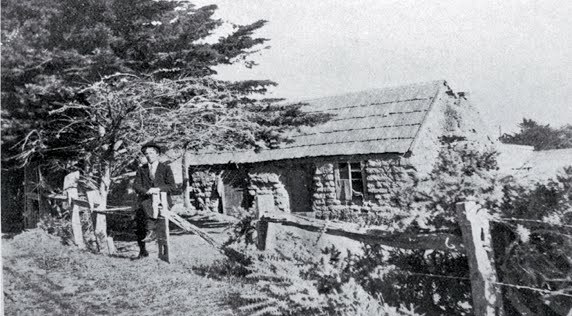 The depot on the Heathcote side was Coppells Cottage which stood on the corner of Port Hills and Bridle Path Rd. From here or from the Birdsey Hotel a little further down the road travellers could take a cart service to the ferry, or from 1862, from Heathcote right into the city. Travellers who wished to avoid the toll at Ferrymead could journey along Port Hills Road to cross the river at Opawa. This road follows the line of an old Maori track to Opawa and (thence over the hills to the Maori settlement of Rapaki). Continue down Bridle Path Road and turn left into Rollin Street. Park opposite Valley Inn Hotel and enter the gate adjoining the rail line to view the original Station platform, and the rail portal. RAIL TUNNEL: In April 1854 a commission appointed by Superintendent Fitzgerald to examine options for transport between the port and the city recommended completion of the Lyttelton-Sumner Rd and the construction of a rail tunnel. Priority was given to completion of the road but rail was seen as the long term solution. In 1857, Moorhouse, who was now Superintendent, announced plans to construct a rail tunnel between Christchurch and Lyttelton. It was a daring project for such a young settlement, one which was initially opposed by a number of prominent settlers including FitzGerald, despite the recommendations of the commission he had established. The doubts of the opponents must have seemed justified when the initial contractors, a leading British railway engineering firm pulled out because of concern that the project would exceed the estimated costs after meeting with the hard volcanic rock. However, Moorhouse was not to be deterred. Persuaded by Haast's masterly geological analysis, he went to Australia where he secured a contract with the firm of Holmes and Richardson, who completed the tunnel successfully. Work began on 17 July 1861. Tunnelling took place from both sides with a break through on 24 May 1867. Because of difficulties caused by the hard rock work was not completed until late in 1867. A trial train trip took place on 18 November and the line was officially opened to passenger traffic on the 9th of December 1867. Construction of the tunnel was a notable engineering achievement. At the time it was one of the longest tunnels in the world and the system of ventilation devised by local engineers was copied elsewhere. It was also the first tunnel in the world to be driven through the walls of an extinct volcano, which made it difficult to predict with any accuracy the direction of the layers of hard igneous rock, hence the caution of the original contractors. Completion of the tunnel ensured the viability of Lyttleton as a port and led to the ultimate demise of shipping on the Heathcote and to the eclipse of Ferrymead as a transport hub. Bricks for the tunnel were made on the site directly opposite the platform (now a defunct maltworks). VALLEY INN HOTEL: Formerly known as the Heathcote Valley Hotel, the building began life as a boarding house for the men working on the water reservoir. The license was originally granted in 1862 to John Birdsey who operated from a hut along the Bridle Path but it was transferred to the present premises in 1877. It is worth taking the time to look at the collection of interesting historic photos inside. Continue down Railway Station Rd, cross Martindales Rd into Truscotts Rd. Ferrymead Heritage Park contains notable exhibits relating to transport history. These include a tramway, trolleybuses, steam trains, and a collection of vintage vehicles. The train runs on the original Ferrymead Railway embankment but the gauge of the track is the standard 3ft 6 gauge. When the railway was built it had a broad gauge track (5ft 3in). The gauge of New Zealand railways was subsequently standardised to 3 ft 6 in. A piece of the original track can be seen on the station platform. If you do not have time to visit Ferrymead Heritage Park at this stage, detour down the road to the left just beyond the entrance. From here you can get a clear view of the rail embankment, and the location of the Steam Wharf. The railway stations are not original. Rejoin Bridle Path Rd and return to the beginning of the trail. Those wanting to explore further elements of the history of transport on the Heathcote should visit the City Council Information Panel in the reserve off Settlers Crescent on the opposite side of the river. This is located alongside the site of the original ferry crossing. From here you can follow the Towpath Walk up to the site of the of the Steam Wharf, marked by a bollard which can also be observed from the roundabout at the junction of Ferry Road and Tunnel Road. This was the upper point for larger vessels. Vessels were usually towed by horse on this stretch of the river as its meandering flow, fickle winds and strong tidal flow made progress slow. Smaller vessels could continue further upstream to Christchurch Quay in Woolston, located just east of the Radley St Bridge. .